Look out later for a very special Florist Friday blog post! In the meantime, here’s this week’s Flowerona Tips post. Google Alerts have just been given a makeover! 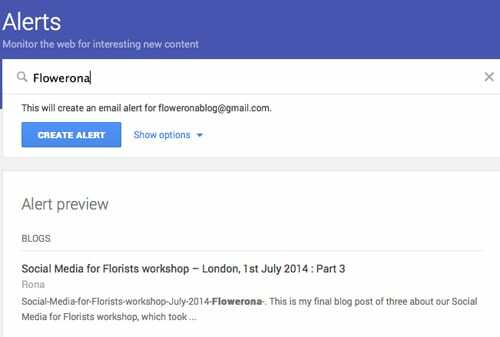 If you’ve not heard about them before, Google Alerts are email updates sent to you when Google finds new results to the searches you’ve set up. 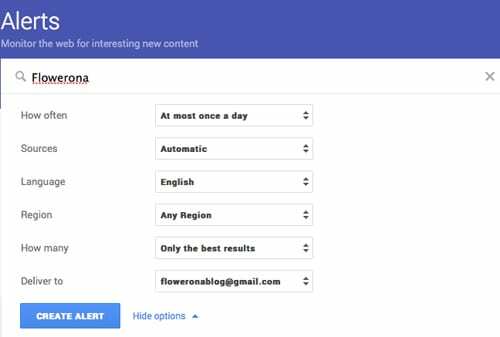 For example, if I set up an search on the term ‘Flowerona’, I’ll receive a Google Alert when Flowerona is mentioned in web pages, newspaper articles or blog posts. So, why should you use them? Well, they’re a great way of keeping up-to-date with when you or your company are mentioned online, plus be alerted about what your competitors are up to and what’s happening in your industry. And they’re so easy to set up! Wedding Blog Awards 2016 | Flowerona has been shortlisted for the Best Wedding Flowers Blog Award!